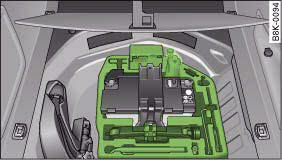 The tools and the Tyre Mobility System are stored under the floor panel in the luggage compartment. If you need the tools, the Tyre Mobility System or the jack*, you will have to open the floor panel and take out the spare wheel*. Some of the parts listed are only fitted on certain models or are optional extras. Before stowing the jack* again, wind down the arm of the jack as far as it will go. • Do not use the hexagonal socket in the screwdriver handle to tighten the wheel bolts. It is not possible to tighten the bolts with the required torque – risk of accident. • The jack supplied by the factory is only designed for changing wheels on this model. On no account attempt to use it for lifting heavier vehicles or other loads – risk of injury. • Never start the engine when the vehicle is on the jack - risk of accident. • If work has to be done under the vehicle, ensure that it is safely supported on stands designed for the purpose, otherwise there is a risk of injury.